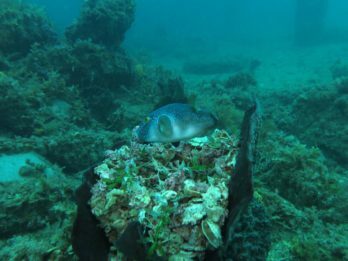 More Fish Behaviour Reports Are Coming Through | Marine Life Society of South Australia Inc. Since writing Blennies Found Mating in January, more information has been coming through to me regarding fish behaviour. 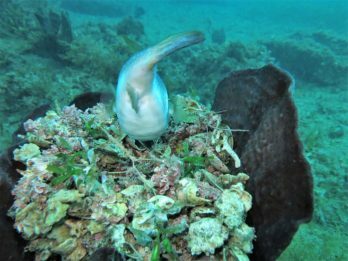 Ralph Kinasz recently reported having built up a relationship with a ringed toadfish, Omegophora armilla. “The relationship I built with this fish was quite awesome,” he said, “but the tale is also a cautionary one for those of us that think we do no harm, by taking only photos and leaving only bubbles. This awesome fish never got to use its impressive bower it so painstakingly built and maintained because too many divers bothered it. It liked me because I brought it gifts and let it approach me. I didn’t chase it with cameras and lights, but others did, and it eventually couldn’t cope. 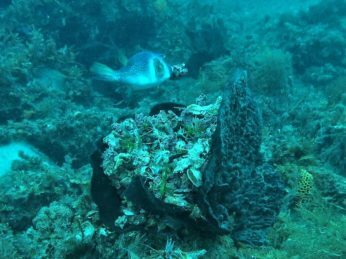 These photos were taken after at least 10 dives with this industrious toad fish,” he said. “Ever since I saw the amazing work of the lyre and Bower birds building fancy nests to impress the ladies, and having it so perfectly narrated by David Attenborough, I’ve always dreamed of seeing it in real life. Not long ago, I had the privilege of watching something far better. 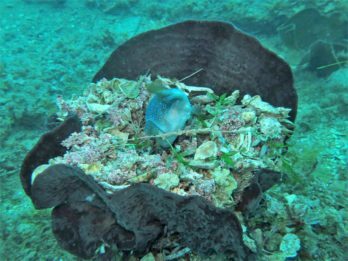 This industrious ringed pufferfish has spent weeks building his nest, arranging white and pink objects (mostly coral, shells and crab claws) with some fresh seaweed layered on top, that he changes regularly. He is so commented that he even changes the pattern of his nest from time to time. 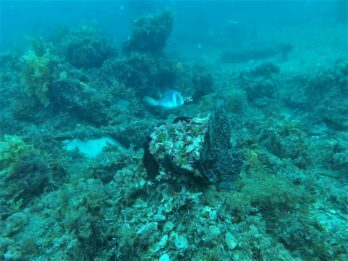 I’ve seen him busily working away for a few weeks now (and) most of his work now is just removing “inferior” pieces as he scours the sea floor to find only the best,” he said. Filippo Pappalardo added, “I’ve seen something similar (less spectacular) in Italy. I noticed a Coris julis carrying some seaweed and eventually realised they make nests!”. “Nature is amazing when you see unexpected, unscripted behaviour! 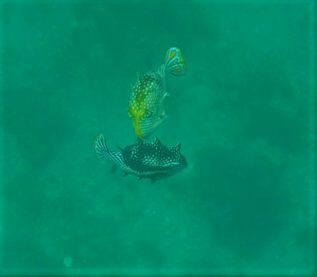 On my 100th dive, as I was ascending, I was rewarded – I saw two Ornate Cowfish off the sandy bottom (unusual) at about 8m depth doing the COWFISH MATING/SPAWNING DANCE (yep!). 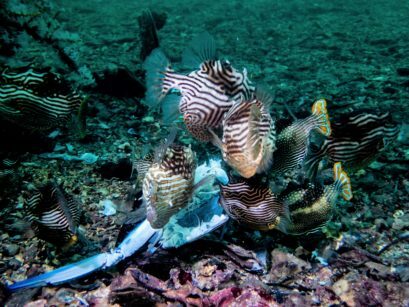 Wayne said that he hadn’t seen such feeding behaviour by cowfish before. We witnessed 2 ornate cowfish doing a ‘dance’ today at Port Noarlunga, similar to Wayne’s description (& yes, they were both male). We didn’t see an obvious female in the vicinity at the time.